The Teens vs. Parents Leader's Guide contains 4 lessons filled with thought-provoking questions and activities on how teens can build healthy relationships with their parents. 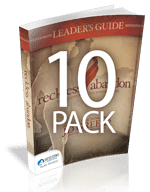 This guide leaves room for open discussion, but also gives the leader plenty of material to work with. Whether you're leading a group as a volunteer or a paid staff member, this guide is key to guiding your group's time together.